There are a lot of misconceptions and misinformation about perimenopause and menopause. Let’s get to the facts! It’s also known an menopause transition or climacteric, and is the gradual change from getting periods, to not getting them. Contrary to popular belief, this doesn’t happen immediately, but there’s a normal transition period where you have symptoms of menopause, but also still have periods. As far as hormones go, the ovaries gradually rebalance their estrogen and progesterone production in preparation menopause. Basically, it’s a serious drop in estrogen. Find out more here: What are Perimenopausal Signs and Symptoms? Your doctor is likely to make a diagnosis based on your age and symptoms. Or, a blood test can be done to check your hormone levels. However, hormone levels vary considerably from day to day so this isn’t really the most accurate measure. Perimenopause: When to See a Doctor? When you start to notice symptoms of perimenopause, it’s a good idea to check in with your family doctor. You can discuss the severity of things like hot flashes, and changing periods and find out if things like Hormone Replacement Therapy are right for you. In addition, just because you’re approaching menopause, doesn’t mean that every single change that happens with your period is related to that. It is still entirely possible to have a wide range of other medical conditions, some serious, some not. If you notice your period getting longer or shorter, heavier or lighter, or your cycle length changing, check in with your doctor. Or, if something just seems not quite right. What Age Does Perimenopause Occur? According to research, it can take place several years before menopause. Because the average age of menopause is around 50, it often takes place in the mid 40’s. For early menopause, perimenopause can happen in the late 30’s or early 40’s. Learn more here: Menopause Age Range. Most people find that they have symptoms for 4-8 years before menopause, although it can stretch as long as 10 years. It officially ends when you’re gone 12 months without having a period. Congratulations! You’ve now reached menopause. Learn more here: Perimenopausal Stages. When do periods stop? The average age is 51.5, but it largely depends on when your mother went through menopause. When does perimenopause end, and menopause start? It’s a great question, but there’s no easy answer because everyone is different! Some people experience only a couple years of perimenopause, while others have 10 years worth of it. However, one of the surest signs that menopause is approaching is when you start to have periods that are further and further apart. Menopause officially begins when you don’t have a period for a year. Is there a Way to Prevent Periomenopause? Is there anything I can do to prevent menopause? The easy answer is no! There really isn’t much you can do because it’s a natural thing. It’s the same as how you have no control over when you get your period. What you can do is manage your symptoms when they do happen. For most people, it’s just a natural process and not something that needs to be medically treated. However, around 10% of people experience some terrible symptoms such as extreme hot flashes and require HRT (hormone replacement therapy). But, this is only for the exceptional cases and shouldn’t be the norm. Most people are able to make this transition without medical intervention. You can learn more here: Supplements to Consider for Perimenopause. Can I still get my period during perimenopause? Yes! You will get them, but they will probably be more irregular than you’re used to. You’ve officially begun menopause when you haven’t had a period for 12 months. More information about this here: Everything you Need to Know about Perimenopausal Periods. 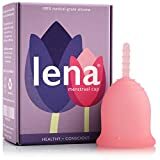 What Period Protection Should I Use? What about Perimenopause and Weight Gain? Many people gain some weight during the period before menopause. Part of it is the natural aging process, but part of it is related to changing hormonal levels. Find out more here: Weight Gain and Perimenopause. Can I Get Pregant During Perimenopause? The ovaries are still producing eggs during this life phase, so you can get pregnant. It’s recommended that you use birth control, or other form of protection for at least a year after getting your last period. Are Perimenopause and Premenopause the Same? A common question that people have is whether perimenopause and premonpause are the same things. We mean, aren’t they just two words that describe basically the same thing? Let’s find out! This stage of life is when you may have some hormonal changes going on in your body, but you’ll have no noticeable changes or symptoms. Perimenopause is when changing hormones cause you to have symptoms such as hot flashes, mood swings, insomnia, etc. You will still have periods, and are able to get pregnant, but it will be quite difficult. Are Perimenopause and Menopause the Same? A common question that people have is whether or not the terms, Perimenopause and Menopause can be used interchangeably. Technically, they are different things. Perimenopause is the periods of time before menopause. It’s characterized by fluctuating hormones and symptoms resulting from this. It generally lasts for 4-10 years. Menopause is when menstruation ceases. Periods will get further and further apart during perimenopause. Once they stop for 12 months, you’ve officially entered into menopause. Is it Possible to Delay Perimenopause? Okay, so you’re trying to get pregnant, and want to delay menopause as long as possible. Is there any way to delay perimenopause, and eventually menopause? In general, no. Although some things like smoking have been shown to cause a slightly early menopause. However, genetics plays a far bigger factor in this than anything you can do, or not do. Learn more about that here: Menopause Age Range. There are even some people who go through menopause far earlier than normal. Find out more here: Early Menopause FAQs. The Menopause Survival Kit: Makes Aging a Breeze! Do Men Go Through Perimenopause and Menopause? It all seems so unfair! Women have to go through perimenopause with hot flashes, weight gain and moodiness, but men don’t have to. But, there is a well documented phenomenon known as Andropause, or more commonly known as Male Menopause. And questions or thoughts? Leave a comment below and let us know.